Wednesday was another commute in a long week of commutes in crazy weather. I misread the reports and decked myself out for a monsoon, plastic pants and all. Yeah, I didn’t quite need those. The commute went off without incident, to and from, until I started up Charles from the station to home. Charles has been under construction for awhile now, inching closer and closer to North Avenue. This is a main drag of Baltimore’s White Stripe, and it was in terrible condition–time for a real fix, inconvenient and dusty as it might be. I’m always a fan of infrastructure investment–let’s spend our social wage (taxes) on stuff we can all use, but where’s the bike lane on this thing? Can we at least have a bus/bike lane? Oh well–we’re getting a cycletrack on Maryland Avenue, a dangerous bike lane on Saint Paul, and we’ve got a bike boulevard on Guilford, so maybe I’m just getting greedy, wanting my own special lane on for my northbound rides. Or maybe making streets safe for all users and not engineering expressways in residential areas should be a priority, or not, what do I know I’m not an engineer. Patience, patience, they’re not even done yet, there must be something I don’t know. 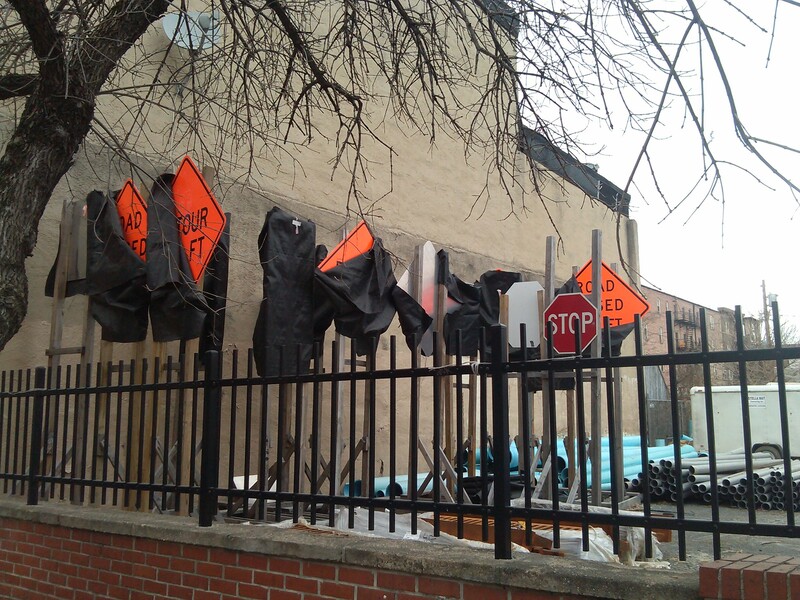 I snapped this picture of the safety sign waiting area in the empty lot near 26th–maybe they’ll just drag all of those out and line the street with them to remind cars not to hit the rest of us. Safety first, last, and always. This entry was posted in construction, safety, signs, street work and tagged Baltimore, Charles, complete streets. Bookmark the permalink.